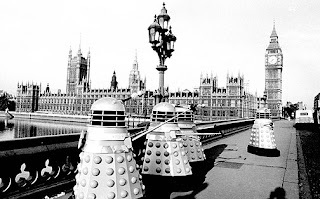 1964 was bookended by Daleks. On TV at least. If you look further down this post you'll see that, in other mediums, they were bloody everywhere. But, as 1964 began, the Daleks had only been in existence for a couple of weeks and I doubt anyone knew how popular they'd become or now quickly. It's hard to say what exactly it was that made them so popular. 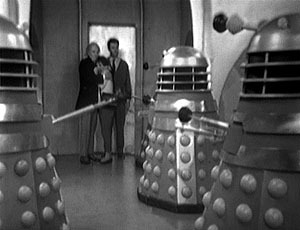 Was it the grating voice, the fact that the Daleks were so utterly ruthless or just that they looked like nothing else that had been on TV at the time? Most likely it was a combination of these factors although I'd like to think that the story itself also helped to cement the Daleks', and indeed Doctor Who's, popularity. The fact is that 'The Daleks' is a nice, straight-forward, science-fiction adventure story with clear-cut bad guys (the Daleks) and good guys (the peace loving Thals plus the Doctor and co). That said, the Doctor is still a bit of git here, more concerned with his own and Susan's safety than with helping the Thals. It's Ian who takes the heroic lead role. The Doctor is very much a background figure here, coming up with a few good ideas here and there to help out. But for the most part he's still a scientist and explorer first and a (reluctant) hero second. That will start to change by the end of the year. It's interesting that after just 3 months or so on screen Doctor Who had managed to show how much range it had. 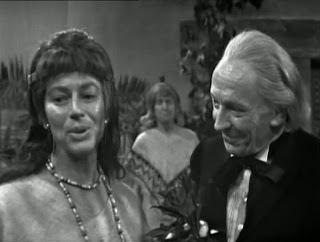 We went from caveman politics in 'An Unearthly Child' to adventure serial in 'The Daleks' to the next story in the series 'Edge of Destriction' which is just plain bizarre. 'Edge of Destruction' (written by then script editor David Whitaker) was, and indeed still is. the only story set entirely within the TARDIS. It begins with an explosion that knocks the TARDIS crew out and causes them, initially, to lose their memories. As they begin to regain their memories the crew start to believe, first, that something is in the TARDIS with them and then they start to turn on each other. That alone would be enough for most stories But then the weird stuff starts happening. We have melting, clock faces, weird noises, the TARDIS doors opening and closing of their own accord, mysterious images on the scanner and a lot of shouting and screaming, Truthfully, the explanation for all this weirdness is a bit disappointing (a broken switch on the console? Really?) but the story does bring the travellers together as friends and the Doctor starts to mellow. The stage is very much set for the rest of the season. 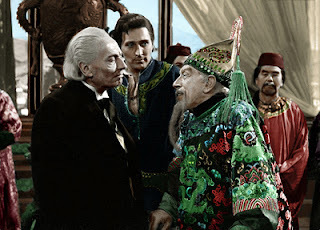 Up next is 'Marco Polo' which, as the title suggests, featured the first instance of the Doctor and his friends meeting a real historical figure. They join Marco and his caravan on his long trek from the Himalayas to China, after he confiscates the Doctor's 'flying caravan', intending to give it to Kublai Khan as a gift. In TV time, the story takes 7 episodes. From the characters point of view though it's closer to 7 months travelling, one of the longest period that the Doctor has ever spent in one place in the series. Because of the length and nature of the story you really do grow fond of Marco and the other members of his caravan and it's rather sad when they eventually reach China and the time comes for the TARDIS crew to finally be on their way once more. 'The Keys of Marinus' (a rare non-Dalek story by Terry Nation) also involves the TARDIS crew doing a lot of travelling although this time by faster means than in the previous story. 'The Keys of Marinus' is the first example of a 'quest' story in Doctor Who - basically, a story that involves the Doctor searching for something, usually against the clock. 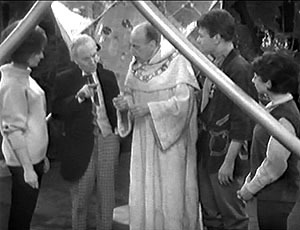 Here, the Doctor is searching for the keys to the 'Conscience of Marinus', a giant machine that will serve to halt an invasion from the rather odd looking Voord. That said, it's actually the Doctor's companions that do most of the searching. 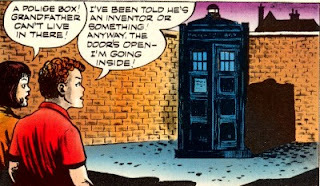 William Hartnell took two weeks off during the making of this story and doesn't appear in two episodes meaning that it's down to the rest of the TARDIS crew to find two of the four missing keys. 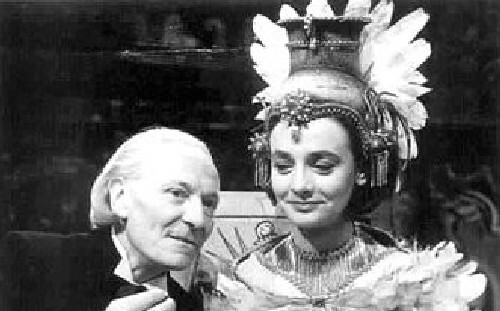 When he does return towards the end of the story, Hartnell seems all the better for his holiday. The Doctor firmly takes centre stage and, for arguably the first time, the Doctor becomes the heroic figure that we're all so used to as he fights to free an unjustly imprisoned Ian in the closing episodes. And it's not just her that's goes through the emotional wringer in this story. The Doctor himself is involved in a very tender 'romance' with an Aztec lady named Cameca to whom he inadvertently becomes engaged. 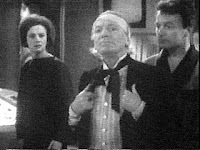 Eventually, of course, the Doctor is forced to leave her behind but, even though their relationship is brief, the viewer is left in no doubt that the Doctor has been affected by the encounter. It's safe to say to that the ending of this particular story is somewhat downbeat. The penultimate story of the first season is 'The Sensorites' which takes us back to the future and a mysterious planet known as the Sense-Sphere. This time it's Susan who takes centre-stage as her encounters with the alien Sensorites causes some long-dormant mental powers to come to the fore. This story also, whether intentional or not, seems to be sowing the seeds for Susan's departure as she starts to wander what it would be like to stop travelling and settle down somewhere. And so we reach the end of the first season with 'The Reign of Terror', another trip back into history, this time to the French Revolution. In this instance, though, the Revolution would not be televised with most of it happening off-screen, although we do meet two more important historical figures in Napoleon and Robespierre. 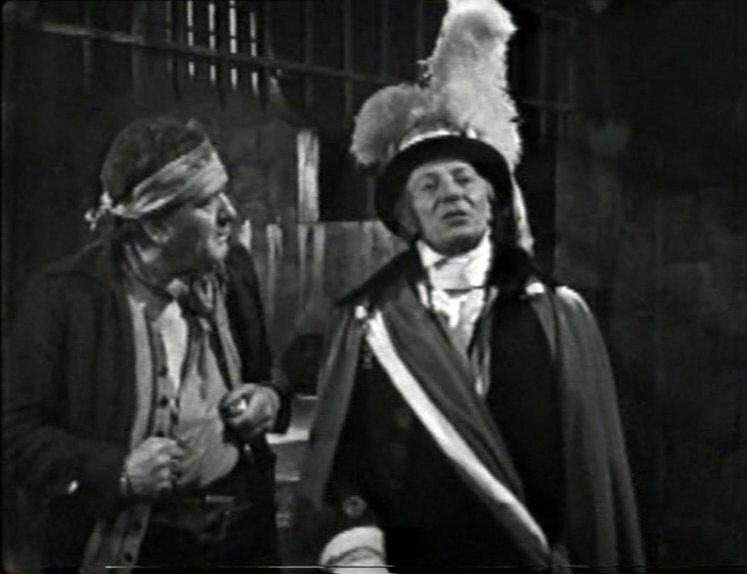 The Revolution, though, is really the backdrop for the main story, which sees the Doctor's companions involved in a spy-plot and sees them all, at one point or another being imprisoned in the Conciergerie prison in Paris. The Doctor, mostly working alone here, uses a disguise for the first time in order to help his friends out of their predicament. So with the Doctor and his companions reunited once again they leave the French Revolution behind and fly off into the unknown, ending the first season after 42 episodes. 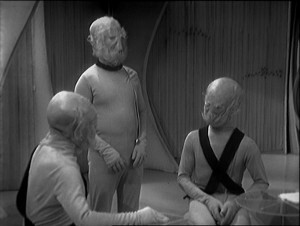 Less than 2 months later, on 31 October 1964, they were back for the start of season 2, kicking off with Planet of Giants. The story features the TARDIS and it's crew being miniaturised by accident when they land in present day England. The crew in their miniaturised form manage to stop an immoral businessman from manufacturing a form of insecticide that is dangerous to all forms of life, including human beings. It's a very slight story that, if the Doctor and co were at full size, would probably be wrapped up in five minutes. As it is the story takes 3 episodes. Fortunately the gimmick of a tiny TARDIS crew plus the highly impressive 'giant' sets help to gloss over the story's shortcomings. 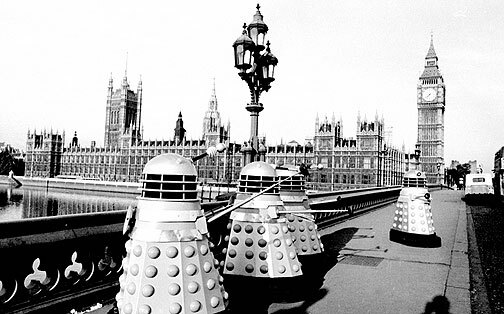 And so we reach the final story of 1964 and, yes as promised, the Daleks are back this time invading Earth. Given their popularity it was probably inevitable that they would return and the fact that they are on Earth, albeit an Earth of the 23rd Century, makes it all the more exciting. Their reason for invading the Earth is somewhat silly but everyone takes it so seriously that you can't help but be dragged into the drama of it. This scene shows, for me, how far the Doctor has come in this past year. At the beginning of 1964 I couldn't have imagined him making the sort of emotional speech that he gives here. So the year ends on a downbeat note. Susan, the last link with his family, is gone but the Doctor still has two friends (and they are his friends now) with him and many more adventures ahead. After just a year on air, Doctor Who was blessed with its first novelty record. In fact there were two although one was more of a Dalek novelty record than a Doctor Who one. The first of these was a recording of the Doctor Who theme tune, released by the BBC. Releasing the theme tune as a record would become a regular occurrence in later years whenever the theme tune was re-arranged for TV. This was essentially the same tune as was heard every week on the programme, albeit with a few slight alternations. I imagine that most people who bought the record at the time wouldn't have been able to tell the difference. The second record is one of the earliest attempts by someone to shamelessly cash-in on the popularity of the Daleks. I'm Gonna Spend My Christmas with a Dalek by the Go-Gos was released in late 1964, not surprisingly just in time for Christmas. Needless to say it didn't make the Christmas Number 1 spot and the Go-Gos were soon gone-gone. As, at the time of writing it's just a week or two to Christmas, I've included the song here for you all to enjoy. Book-wise things slowly began to take off in 1964. Two books were released this year and, perhaps not surprisingly, both were Dalek related. Yes, the country was in the early stages of Dalekmania. 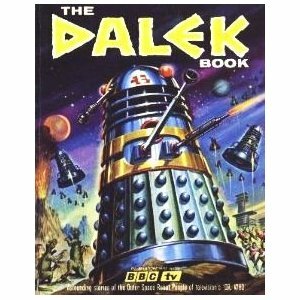 The first of these books was The Dalek Book written by Dalek creator Terry Nation and TV writer and Doctor Who script editor David Whittaker. I must confess that this is one book that I don't own but from the research that I've been able to do, it appears to be a very interesting book. The book contains the first examples of any original fiction based on the TV series. 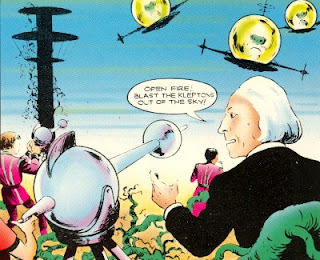 Through a mixture of comic strips and short stories it details the Daleks' attempted invasion of the Solar System and the actions of three siblings, Jeff, Andy and Mary Stone, to stop them. The Doctor himself doesn't appear although Susan does, in a short photo-comic strip that uses photos from the first Dalek TV story to tell a brand new tale. The whole book sounds genuinely fascinating, from an historical point of view if nothing else. 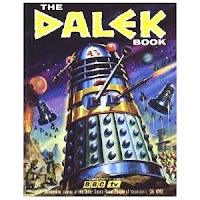 The other book published in 1964 was the equally historically significant novelisation of the first Dalek story, again written by David Whittaker. The publication of Doctor Who and the Daleks (or, to give it its full title: Doctor Who in an Exciting Adventure with the Daleks) marked the beginning of a long tradition of novelising almost all of the television stories. On TV of course, 'The Daleks' was the second story of the series so introductions to the main characters weren't required. 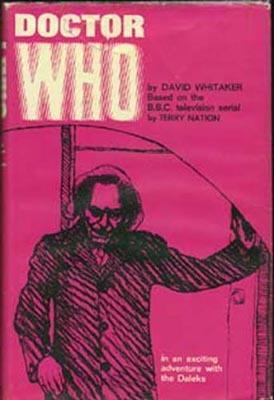 But, as this was the first ever novelisation, Whitaker chose to re-write the beginning of the story in order to introduce new readers to the TARDIS crew. These early chapters, ignore events as they were portrayed 'An Unearthly Child' and instead come up with something very different. Gone is Ian and Barbara following Susan home to an old junkyard. Instead we have a foggy Barnes Common, a car accident and a mysterious old man with everlasting matches. The rest of the book is fairly faithful re-telling of events in 'The Daleks' - the only novelisation, incidentally, to be written in the first-person. There are a few embellishments however, most notably the introduction of a glass Dalek which houses the Dalek's overall leader. A glass or see-through Dalek won't appear in the TV series until the 1980s and the notion of a Dalek ruler such as this one is also something that we won't see for a few years on TV and then it will appear in a story written by Whitaker himself. 'TV Comic' was aimed at a very young child audience while it's fair to say that Doctor Who on TV was aimed at a slightly older audience. Having a Doctor Who comic strip in TV Comic, then was always going to be a slightly odd fit. Nevertheless on 16 November 1964, almost a year after the start of the TV series, the first comic strip appeared in the pages of TV Comic, running in weekly 2-page instalments. The first story was called 'The Klepton Parasites' with art by Neville Main. Conspicuous by their absence were Ian, Barbara and Susan. They were replaced with the Doctor's (apparently) other grandchildren, John and Gillian, Much like Ian and Barbara, the two children encounter the Doctor in a junkyard and are inadvertently whisked off into time and space. Strangely, the children are not too bothered by this turn of events. Much of the rest of the story seems to be inspired by 'The Daleks'. the villainous Kleptons spend most of the their time inside their hidden city and can only venture outside in protective machines where they kidnap members of the peaceful Thain race who also inhabit the planet. They Doctor and his companions have to break into the city to deal with the Kleptons and restore peace to the world. This is something that will crop up time and again in the strip and is often very much at odds with the character as portrayed on screen. This particular strip, at nine episodes, ran well into 1965 so we'll return to look at the further comic strip adventures of Dr Who, John and Gillian then.